NOTE: Before connecting your Wireless-G Game Adapter to an Adhoc Network, please know the following: SSID, Wireless Security and/or Network Key. 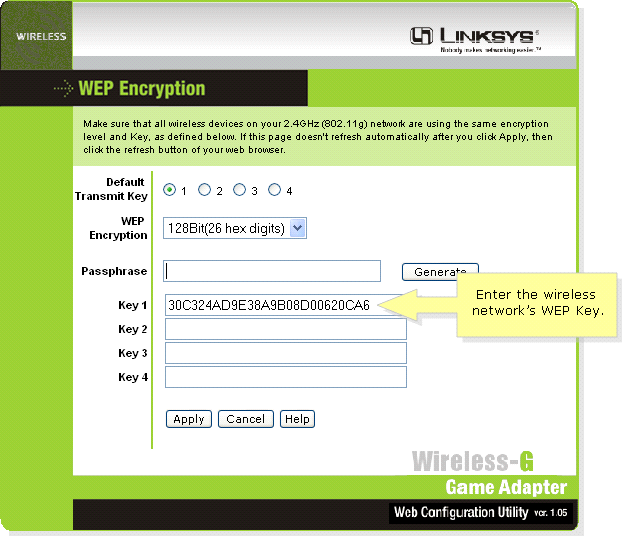 To connect the Game Adapter to an Ad-hoc Network you have to access the Game Adapter’s setup page and configure the wireless settings to match that of the Ad-hoc Network’s. For instructions on how to do this please follow the steps below. Connect the Wireless-G Game Adapter to your computer’s Ethernet port using an Ethernet cable. Assign your computer a static IP address. For instructions, click here. NOTE: To assign a static IP address using Mac, click here. Look for Network Type and select Ad Hoc then select the same channel the Ad-hoc network is using. If WEP is not enabled on the wireless router select Disable then proceed to Step 11. Once your SSID was selected, click Connect.